It is necessary for all activities having to do with water transport and the opening and closing of the stomas. Potassium takes care of the strength and the quality of the plant and controls countless other processes such as the carbohydrate system. Dead edges of the leaves. In case the EC in the substrate or soil is high, you can rinse it with clean water. Tips of the younger leaves show grey edges. 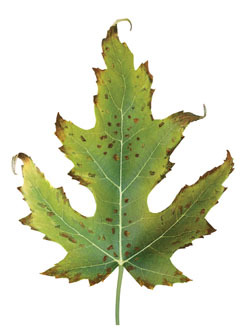 Leaves turn yellow from the edge in the direction of the veins and rusty-coloured dead spots appear in the leaves. Too little, or the wrong type of fertiliser. In case the EC in the substrate or soil is high, you can rinse with water. Add potassium yourself, either in inorganic form: dissolve 5 – 10 grams of potassium nitrate in 10 litres of water. In acidic soils, you can add potassium bicarbonate or potassium hydroxide (5ml in 10 litres of water).